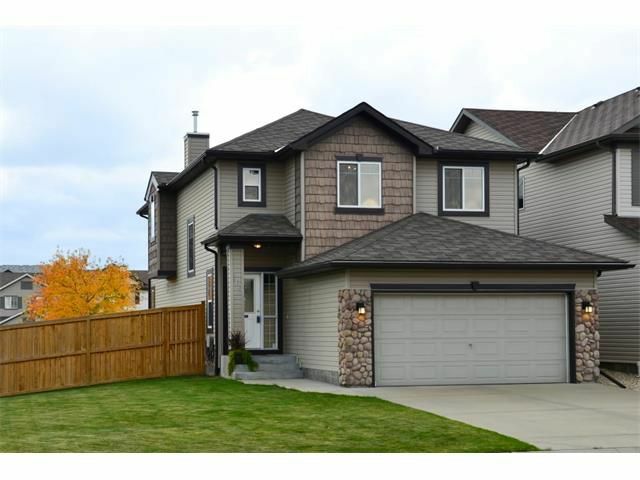 Stunning family home is conveniently located on a quite cul de sac with easy access to Fish Creek Park, schools, and the many amenities found in Evergreen. Maple hardwood flooring & an abundance of south facing windows are found throughout the main floor that offers a formal dining room/den, living room with centred fireplace, dining nook, & 2 pc bath. The kitchen is complete with SS appliances, gas stove, granite counters, garburator, lots of cabinets, raised breakfast bar, & a walk in pantry. The upper level has a spacious bonus room with a corner gas fireplace, side desk area, laundry room with built in shelving & folding table, 3 bedrooms, & 4 pc bath. Master has a large walk in closet with custom organizers & a 5 pc en suite that features dual sinks, separate shower, & soaker tub. This oversized corner lot has a sunny south facing yard with mature trees, gas line for BBQ, & could accommodate RV parking. Additional upgrades include Hunter Douglas blinds throughout, tinted windows on the west facing side of home for privacy, UV protectant layer on all east & south facing windows, new hot water tank, dishwasher, & microwave, custom shelving in garage, cold storage in basement, & is roughed in for sprinklers, speakers, & central vac. Book your showing now so you don’t miss out on this amazing gem!